Facing the city skyline and the harbour, Auckland City Oaks offers apartment-style accommodation featuring 1GB of free WiFi per stay and a fully equipped kitchen. It is located in the heart of Auckland CBD (Central Business District). Centrally located in the heart of Auckland CBD (Central Business District), Waldorf Stadium provides self-contained accommodation with private balconies and fully equipped kitchens. It features access to a swimming pool and fitness centre. 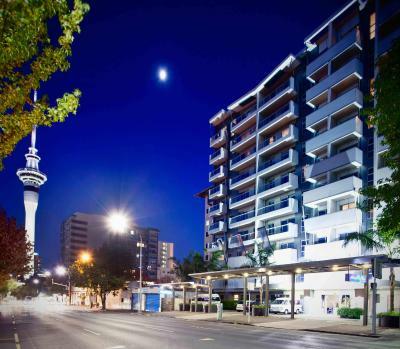 Waldorf Tetra Apartments offer spacious apartment accommodation in the heart of Auckland CBD (Central Business District), just 50 metres from the shops, entertainment and restaurants of Queen Street. Guests receive 1GB of free WiFi per day. Located in Auckland CBD (Central Business District), Waldorf St Martins Apartments Hotel offers luxurious apartments featuring a balcony. Upper Queen Street, Auckland Hospital and Universities are within 10 minutes’ walk. 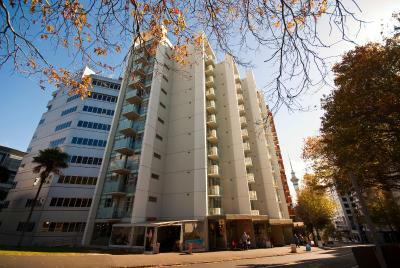 Waldorf Celestion Apartments Hotel is centrally located in Auckland CBD (Central Business District). It provides stylish accommodation overlooking the Hauraki Gulf and the city skyline. Guests receive 1GB of free WiFi per day. Just 10 minutes' drive from Auckland city centre, Auckland Takapuna Oaks offers luxury self-catering apartments. Guests enjoy free secure car parking and up to 1GB free WiFi access. Opened in November 2015, Adina Apartment Hotel Auckland, Britomart offers stylish accommodation just 200 metres from Vector Arena. Guests enjoy 500MB of free WiFi which is provided for up to 4 devices per day. Just 5 minutes’ walk from Viaduct Harbour, Auckland Harbour Oaks offers 1 GB free Wi-Fi per day and modern apartments with amazing harbour or city views. Guests have access to a fitness centre and heated outdoor pool. Offering an indoor pool and a fitness centre, Metro Suites Apartments is 400 metres from Auckland Art Gallery and 400 metres from Skycity Auckland Convention Centre. WiFi access is available.